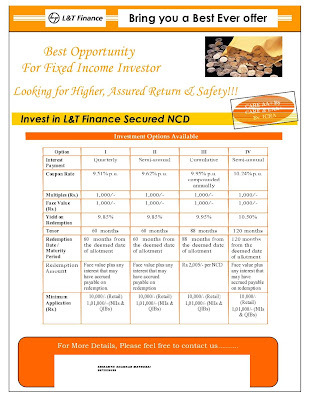 L&T Finance is offering its First Ever NCD. L&T Finance is a 100% subsidiary of L&T. The Company has a good Track record. The Company's Capital Adequacy is very good at 16%. The NCD is secured and the Company is also setting up a Debenture Redemption Reserve by setting aside 50% of the Capital raised in the NCD. Net NPA is only 2.04% as on 31/3/09 and that too due to Economic downturn and prudent Accounting norms. L&T Finance has NEVER been downgraded!!. The better return is the biggest attraction. Banks like the SBI is offering around 8% return on a 5 year FD and here L&T Finance is offering 9.5% with a better liquidity. Good Rating from both CARE and ICRA. CARE has given a AA+ and ICRA has rated the issue LAA+ indicating LOW RISK. Definitely better than any Fixed Deposit because of its better liquidity and Tax Benefits. There is even a chance of Capital Gain because of its listing in Stock Markets and the greater interest in Retail Bond Market growing everyday. Any major fall in yields of Debt instruments would present L&T NCD investor with an opportunity to Cash out by selling in the Stock Markets. The Company has also indicated that it may consider Buyback of the NCD and also consider giving loans to the holders of the NCD, in future. INVEST preferably in the 10 year option and lock in the higher interest rates offered.